Hey this is cool, would you mind sharing the specific type of the card? Or even better, a link to it? Thanks! I think the card is this model: http://www.ebay.com/itm/Apple-BCM94360CD-802-11ac-Wifi-Bluetooth-4-0-Card-for-2013-21-5-27-iMac-/111382033777?pt=US_Internal_Network_Cards&hash=item19eee2f571 However, it looks like it requires some sort of adapter card (the card underneath) that I can’t make out. Thanks Netkas, this offers a lifeline to those clinging to our very capable still 2008 mac pro’s. As Martin says any chance yourself or McVidCards could provide a link so that we may purchase something like this. Much appreciated. Jeff, right, it requires adapter to be able to work off mini-pcie port. I has no link for it tho. Would this adapter necessary in mid 2011 iMacs? Yes, please, where can we order that adapter? I’ve ordered today both the airport card, and the chinese taobao pci-e adapter for it. Now I see this, and it looks like a beautiful solution. Any way we can convince you to pull it out and post better pics of it? Perhaps we can find a source for them. I’ve been scouring the internet myself, but it’s a fairly tough filter job when you don’t know what it’s called or who made it. OK, before the stampede, lets get the caveats out there. The reason I never saw this before Netkas found it is that i was told Mac MiniPCIE didn’t wire through to USB. So when i made the first one I didn’t solder the USB pins. The 2008 is my lab machine and I installed the soldered board in, so as predicted, no USB. I then got some pre-made boards and put in 2009. 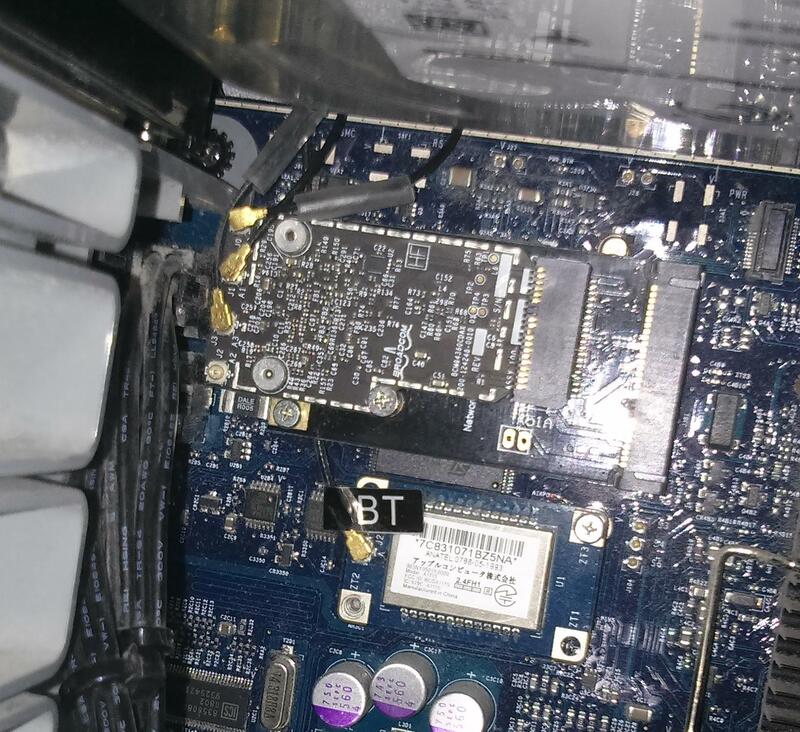 I think we what have discovered is that 2009-12 MP don’t have the Mini-PCIE to USB while older ones do. Likely that 2006 would work. Oddly, I had to remove the bit-in module to make mine work. Both showed up but it preferred the built in until I removed it. How about altering the design to come out to a usb mini-a port and we can simply run a cable from there out the back to a usb port? I think there’d be enough market to be worth a run. Disabling the 2012 bt is easy. nevermind, I see that the taobao card I ordered comes with that exact adapter. It sounded like you built it Rominator. Please! Let me know some details about the pcie adapter! 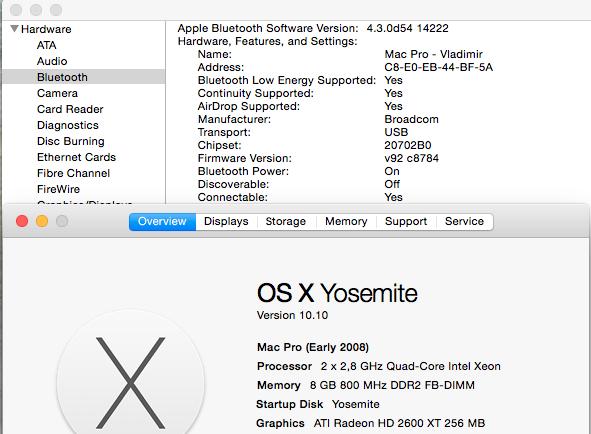 I have a late 2008 MacBook Pro with Yosemite installed and I need absolutely to get Handoff working! Please!!! Thanks for the info, I also have Mac Pro early 2008, is there any info on the adapter and would it really work? I wonder what happens to the Bluetooth that is on the board is it possible to remove it after upgrade?? Please netkas help us MP 2008 users to upgrade, where can we buy the adapter??? Ok well I jumped out there and ordered the linked airport card and the linked adapter card that are in the comments. I have a kid 2007 20″ iMac core 2 extreme. I will let you guys know if it works! Hi nandor690, did you order m2-ngff?? I'm still trying to return mine, I am ordering from a different seller now to ensure it is an apple tested and verified card that supports handoff. You can get the BCM20702A0 to work with hacking but working and supporting 10.10 handoff are two different things. Which is what this is about. Hi again any news on m-2 adapter dose it work? ?